Ginger beer is a key ingredient in some of our favorite warm-weather drinks (Moscow Mule, anyone? ), and the season for it is here—and this year, we’re brewing up our own. By fermenting a half-pound of fresh ginger with raw sugar, molasses and fresh lime juice, we’ve created a potent ginger beer with a pepper-packed punch. With loads of fresh ginger spice, this brew holds its own when mixed with spirits, but it’s just as refreshing on its own over ice. 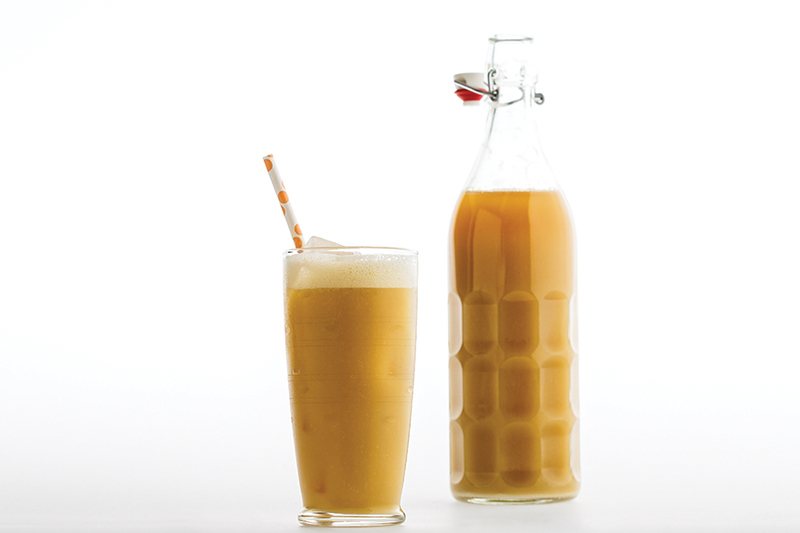 Fans of super-spicy ginger beer will never reach for a bottle of the store-bought stuff again. Plus, you can make it in less than an hour, and it’ll be ready to drink the next day—how’s that for near-instant summer refreshment? So what’s the difference? Ginger beer is just that: a beer that’s been fermented with yeast to create carbonation (yes, it does have trace amounts of alcohol, though typically less than 1 percent), while ginger ale gets its fizz from being force-carbonated with CO2. And it’s a distinction you can taste—ginger beer is chockful of authentic ginger spice, making it an ideal candidate for cocktails, while ginger ales are typically sweeter, with little (if any) real ginger flavor. 1. In a blender, pulse ginger with 1 quart water until roughly puréed. 2. Combine the ginger-water, sugar and molasses in a large pot over medium-high heat. Stir until the sugar dissolves. 3. Remove from heat and let cool to just slightly warmer than room temperature. Line a funnel with a flour-sack towel or a 4x layer of cheesecloth, and use it to strain the liquid in batches into a plastic 2-liter bottle, squeezing the towel or cheesecloth to extract as much liquid as possible. 4. Add the lime juice and remaining quart of water until the liquid level is about 3 inches from the top (this may not require the full quart). Sprinkle the yeast on top of the liquid in the bottle. 6. Once the bottle is firm, transfer to the refrigerator. Keep ginger beer refrigerated, and drink within 1 week. Houndstooth Coffee Drink: Ginger Oh, Snap!